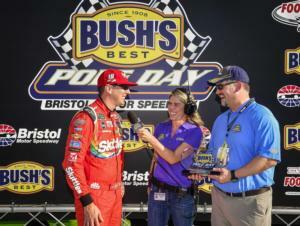 On Bush's Beans Pole Day at Bristol Motor Speedway, the Busch brothers led the way. Kyle Busch edged older brother Kurt Busch on Friday to win the pole for the Food City 500. It is the third time in their Monster Energy NASCAR Cup Series careers that the Busch brothers have swept the front row for a race. Kyle also scored the pole the two previous times. "He always told everybody, 'If you think I'm good, wait for my younger brother,'" said Kyle, who drives the No. 18 Joe Gibbs Racing Toyota. "I'm glad I'm living up to it." 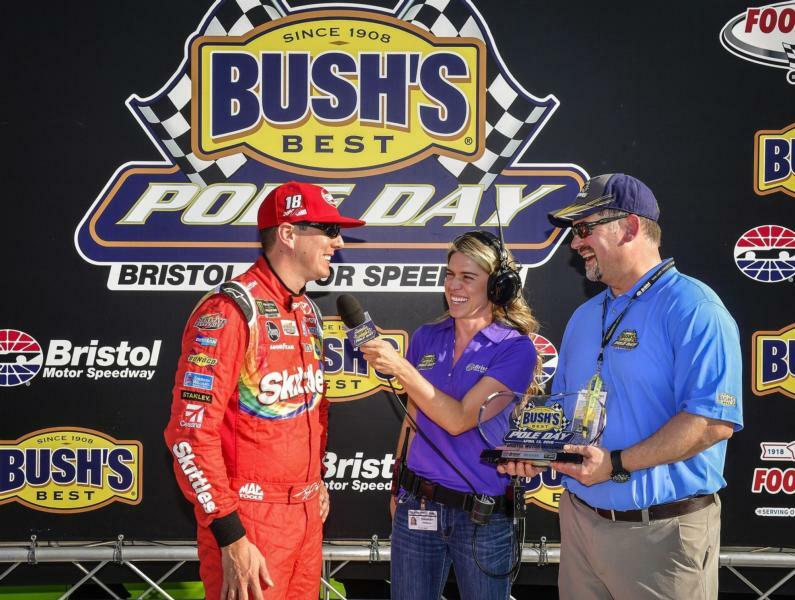 The Busch brothers are no strangers to success at Bristol Motor Speedway. In 2002, Kurt Busch scored his first career Cup Series victory at the track. He's won here four times since. Kyle Busch owns 20 victories across NASCAR's top three divisions. In August, he completed his second career sweep of the track's Cup Series-Xfinity Series-Camping World Truck Series triple-header race weekend. On Friday, he circled the track in 14.895 seconds (128.822 mph) compared to 14.897 seconds (128.804 mph) for his brother, Kurt. "Super close," said Kurt, who drives the No. 41 Stewart-Haas Racing Ford. "You have to hit it just right at Bristol because the lap times are below 15 seconds. Any little miss and you know you're not going to get the pole because there's no time to gain it back. It's real similar to drag racing. It's a quarter-mile long and any time you have one little slip you don't have time to gain it back. Except here, it's just two quarter-miles. I slipped up just a little bit in Turn 1 and that was all that Kyle needed to get by us." Qualifying proved to be an exercise in gamesmanship. NASCAR splits qualifying into three timed rounds, whittling down the contenders to a final group of 12 that vies for the pole position. On Friday, teams opted to wait for several minutes before sending their drivers onto the track to make their qualifying runs. Nobody wanted to be the first to drive on the traction compound, Kurt Busch explained. That made for hectic finishes to each round. Kyle Busch lead Round 1 of qualifying followed by his brother and Kurt Busch led Round 2 followed by Kyle. "I was not real sure we were going to be able to get there (at the end)," said Kyle Busch, who leads the series' points standings through seven races and is coming off a victory last week at Texas Motor Speedway. "Our guys did a great job here today bringing a fast Skittles Camry to the track and just making some good adjustments there to it through the qualifying rounds and making sure we were staying on top of things. We got a little bit tight there in the final round but was able to still maintain a quick enough speed in order to beat Kurt out." In the end, Ford placed seven cars in the top 10, including Team Penske's three entries. Brad Keselowski qualified third in the No. 2 Ford. Ryan Blaney qualified fifth in the No. 12 Ford and Joey Logano qualified 10th in the No. 22 Ford. Ricky Stenhouse Jr. earned a season-best fourth place starting spot in the No. 17 Roush Fenway Racing Ford. Defending race winner Jimmie Johnson qualified 17th in the No. 48 Hendrick Motorsports Chevrolet. Denny Hamlin holds the series' qualifying record at Bristol, lapping the track at 131.668 mph in 2016, but was not among the 24 fastest cars and did not advance out of the first qualifying round. He will start 25th in the No. 11 Joe Gibbs Racing Toyota. Reigning series champion Martin Truex Jr. qualified 26th in the No. 78 Furniture Row Racing Toyota. In this race a year ago, Truex led 116 laps and finished eighth. Kevin Harvick and the No. 4 Stewart-Haas Racing Ford team opted not to attempt a qualifying run. In the lone practice session earlier in the day, Harvick hit the Turn 3 wall and the team was forced to pull out its backup car. He will start at the rear of the field in the Food City 500. Cup Series teams are scheduled to practice twice on Saturday, from 8:30 to 9:25 a.m. and from 11:05 to 11:55 a.m. The Food City 500 is scheduled at 2 p.m. Sunday.